Some are calling it a repeat of the SOPA blackout protests. 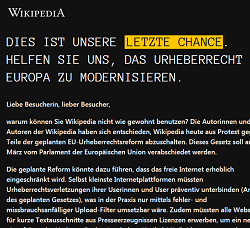 Various websites around the web are blacking out their sites to protest article 13. It’s the next step in a massive week of action. As we reported last week, websites are scheduled to participate in a massive blackout protest. If you are seeing websites you visit being blacked out, that is why. Currently, platforms such as YouTube are not responsible for copyright violations – although they are required to remove content which is found to be breaching copyright. The new laws will shift the balance, making companies liable for copyrighted content that appears on their platforms. One other major site that joined the protests is Reddit. One user posted a screenshot of what that page did. With so much extra publicity this issue is earning, it seems likely to help further fuel the protests on the streets and online as we get closer to the next vote.